Around the middle of March each year in America, many folks wear green to usher in St. Patrick’s Day. Many are not even Irish but use the day to celebrate Irish and Irish American culture with green decorations and by drinking lots of green beer. The traditional dish for this day is of course corned beef and cabbage with potatoes and there are numerous variations of this Irish dish. Corned beef is often the brisket cut which comes from the chest muscles of a cow. It’s salt-cured so it’s pretty salty and the usual method is to simply simmer the meat and use the remaining salty broth to cook the cabbage and potatoes. In its boiled version, the taste is quite bland but if you cook the brisket in a barbecue pit, you bring a lot more flavor due to the color and flavor that smoke imparts to the meat. Also, in the pit, you will be able to form a nice flavorful crust resulting from a chemical reaction called the Maillard reaction which makes it much more tasty and appetizing than just simmering the meat. 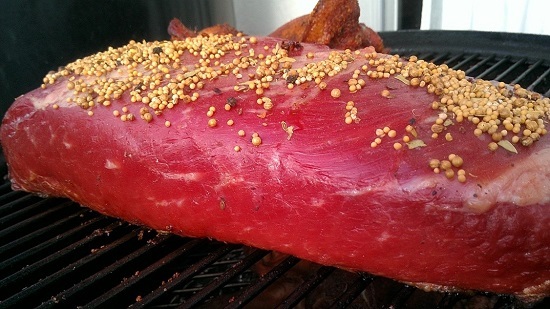 My barbecue corned beef recipe is pretty delicious and it gives me an opportunity to explain what happens when you put meat in pit and cook it low and slow around 250 to 275 degrees. In my previous writings, I’ve never elaborated on the mechanics of how meat is flavored and colored as it cooks in a pit because the meat is covered in some kind of barbecue dry rub so you cannot see the underlying chemical process. In this recipe, I’ll share the technical aspects on how wood and smoke affects food because I can now show you what happens because the corned beef is smoked without any additional seasonings. This knowledge has helped me win many awards and championships. I’ve attached some pictures which will help me illustrate what is happening. Contrary to what most people think, cooking barbecue does not require smoke billowing out of your pit. In fact, the number one mistake I’ve seen beginners make most often is to over smoke their meat. The billowing smoke from a pit is actually made up of small particles in the form of soot, tar, and water in the form of steam. The visible smoke from a pit does not do anything at all to your meat besides make it sooty. The flavor and color of smoked meat actually comes from gasses that are invisible and these invisible gases do almost all the coloring, flavoring, and preserving of the barbecued meat. Sound intriguing? Read on. Wood contains a hard polymer called lignin which accounts for up to a third of its weight. When you heat wood in a pit, the heat causes a chemical reaction called pryolysis when the wood begins to smolder and this releases vaporized organic gases (VOC). At about 390 degree Fahrenheit, pyrolysis causes many types of a class of gases called carbonyls to be released. The carbonyls vapors begin the process of coloring your meat so whether you smoke chicken or pork, the smoky brown color imparted is the same. At around 590, pryolysis releases another class of colorless gases called phenols and there are many kinds. The phenols create the flavor and preservative properties of smoked meats. At around 750-800 degrees the crescendo of carbonyls and phenols reaches full effect. That’s why any seasoned pitmaster will tell you, the kind and temperature of smoke you create is very important. They probably don’t explain it like I have. If your smoke is too “cold”, your meat will be acrid and acidic. If your smoke is too “hot”, you bypass the sweet spot by which carbonyls and phenols are converted from the lignin in your wood and you won’t get a great crust (Maillard) and sheen (pellicite) on your meat. So, it takes a bit of practice to generate good smoke to create great barbecue. The next time you start up your pit and you see billowing smoke, you’ll realize that the visible smoke won’t do much. The heavy lifting is actually done by colorless gasses called carbonyls and phenols interacting with the protein, sugars, and carbohydrates on the meat and spices. Whenever I run my pits, I ensure that I’m in the Goldilocks range of the VOCs, not too hot and not too cold. Start your pit and stabilize at 275 degrees. 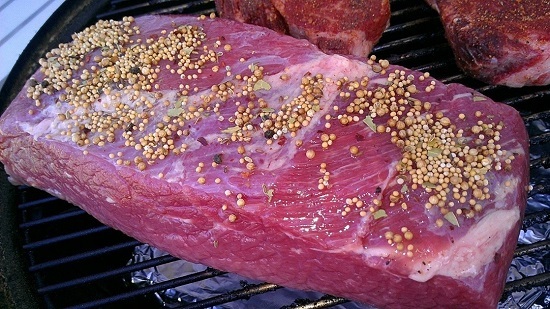 Place the corned beef in the pit and sprinkle the picking spices on top. The spices usually come in a packet with the corned beef. At the same time when you foil the corned beef, put some cut-up red potatoes, seasoned with SYD rub, olive oil, and some Italian parsley into a ½ foil pan and place into the pit. If you like your cabbage smoked, you can cut your cabbage into quarters and place them in the same half foil pan. 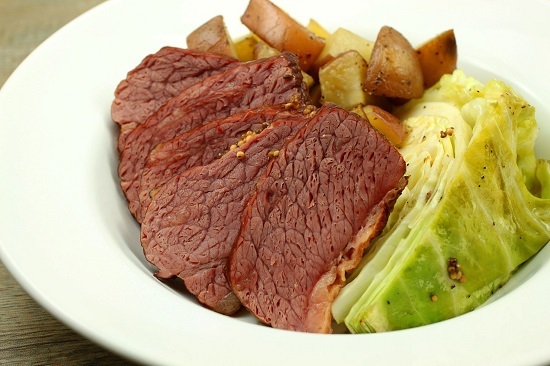 Once corned beef is tender as probed through the foil, remove and rest 15 minutes. Cut into slides across the grain and serve with the potatoes and cabbage. I competed with you in the 2010 American Royal. It was a true experience. This was a great recipe. First time for me smoking a corned beef. Turned out great for a first time. Will definitely do again. The smoker got down to 225 (a bit low) during the last half hour. Will add more coal next time to keep it between 250 and 275. Also will spray with water when I wrap it in foil. Also will leave it on the smoker, in the coil for a minimum of 30 to 45 minutes. Great recipe. Thanks again. Glad to hear you liked the recipe. how much cook time is needed for a 3 lb flat. You say about 2hrs before wrap, how much more after that? Dave, did you get an answer? I am bbq this today for Easter. Thanks! Harry, Will a 3 lb. FLAT work for the above BBQ method???? Thanks!! I would like to try this tomorrow or this weekend. Approximately what is the total cooking time for a 3lb piece of corned beef, so that I can plan when to start. Hmmm . . . I have to guess. For 3lbs @275F, I reckon about 2-3 hours to reach the foil phase and then about 1.5 – 2 hours in foil before it becomes tender.